The correct evaluation of the optic disc, and related structures in ophthalmoscopy, is critical for the diagnosis of open angle glaucoma because usually glaucomatous optic nerve damage firstly occurs in the optic disc before detectable visual field defects become apparent; however, some studies have demonstrated that visual field defects can also be found without any glaucomatous changes in the optic disc. The purpose of this review is to provide a guide to clinicians for the evaluation of the optic disc in glaucoma suspects and patients. This guide can facilitate the diagnosis and exclusion of glaucoma in these subjects. Burak Turgut has nothing to declare in relation to this article. 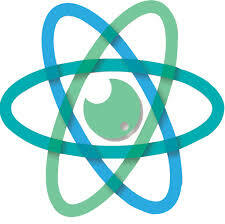 No funding was received in the publication of this article. The optic nerve head (ONH) is the region where retinal ganglion cells (RGCs) leave the eyeball via the scleral canal. It also consists of blood vessels, glial, and connective tissue. Glaucoma is a progressive optic neuropathy characterized by the loss of retinal nerve fibres and the axons of RGCs at the level of the ONH. The primary site for glaucomatous damage is the ONH.1–3 Although the ONH and the optic disc are often used to mean the same thing, in fact the optic disc is the part of the ONH which is observed in ophthalmoscopy. Although there are no clear lines demarcating the histologic layers of ONH, the ONH consists of the surface retinal nerve fibre layer (RNFL), and pre-laminar, laminar (lamina cribrosa [LC]), and retrolaminar layers.1–6 Therefore, we actually observe the superficial RNFL and the optic cup in the ONH. Although retinal tomography and optical coherence tomography (OCT) are useful methods to perform some measurements such as optic disc diameter, CDR, NRR thickness and optic disc area, direct evaluation of the optic disc by the physician is necessary. (X = height of beam (mm); H = height setting on the beam height indicator (mm); D = diameter of the optic disc measured by the beam height indicator (mm); C = correction factor). The optic cup is a central pale excavation in the ONH. The optic cup includes glial tissue but not retinal nerve fibre or RGC axons. The pale color of the cup is due to the exposure of the collagenous LC and the loss of glial tissue. The area of pallor in the center of the disc frequently corresponds well with the area of the cup. Estimation of CDR has only limited value in the identification of GON because of the wide variation in the size of the optic disc and cup in the normal population. In addition, there is the significant individual measurement variability among glaucoma specialists in the evaluation of CDR.29 In case of the adjustment for the optic disc size, CDR has a diagnostic value in early glaucoma. NRR is the tissue in between the outer boundary of the cup and the optic disc margin. Normally, circumlinear blood vessels rest on the NRR. Therefore, in most cases, the boundaries of the optic cup are best identified by following the track and kink of the blood vessels within the ONH. PPA can cause the wrong determination of the boundary of the optic disc and the misinterpretation as NRR.1–6,12,21,30–35 To evaluate the width of the NRR thickness, the cup boundaries should be clearly identified. Measurement of the vertical ONH size at the slit lamp via dilated pupils. 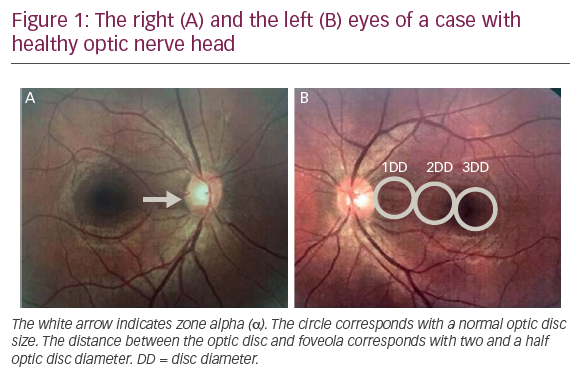 Detection of the vertical and horizontal CDR and careful consideration of the association between optic disc size and optic cup size. Assessment of the integrity of the NRR (diffuse NRR thinning, NRR notching, and NRR pallor) and the review for the characteristic ISNT rule. Exploration the presence of zone β or extensive zone α. Assessment of ONH for the presence of the vascular changes: ONHH, baring or nasalization of vessels, and arteriolar narrowing. Assessment of the peripapillary and retinal RNFL integrity and exploration of focal or diffuse RNFL defects with a red‐free filter. Although an increased cup size, laminar dot sign, nasalization, vertical enlargement of the optic cup, and asymmetry between two eyes greater than 0.2 in the absence of disc size asymmetry are also predictive findings of GON, they are not specific for glaucoma. The single evaluation of CDR is not enough for consideration of the optic disc regarding glaucoma because there is high inter-observer and intra-observer variability among the measurements of CDR of even trained glaucoma specialists. The presence and occurrence of NRR notching, localized RNFL loss, the loss of ISNT rule, bayonetting in ONH, ONHH, and PPA in the form of zone β show associations with open angle glaucomas. So, the detection of a few of these findings in an eye with suspected glaucoma is critical for the diagnosis of GON. Nicolela MT, Optic Nerve: Clinical Examination. In:Giaconi JA, Law SK, Coleman AL, Caprioli J (eds. ), Pearls of Glaucoma Management, Berlin Heidelberg: Springer-Verlag,2010, 15–21. Marjanovic I, The Optic Nerve in Glaucoma. In: Tomas Kubena (ed. ), The Mystery of Glaucoma, Available at: www.intechopen. com/books/the-mystery-of-glaucoma/the-optic-nerve-inglaucoma (accessed 29 August 2017). Susanna Jr R, Medeiros FA, Ophthalmoscopic aspects of the optic nerve in glaucoma: Normal optic disc. In: Susanna Jr R, Medeiros FA (eds. ), The Optic Nerve in Glaucoma, Rio de Jenerio: Cultura Médica, 2006, 1–12. Bourne RR, The optic nerve head in glaucoma, Community Eye Health, 2006;19:44–5. Jonas JB, Budde WM, Diagnosis and Pathogenesis of Glaucomatous Optic Neuropathy: Morphological Aspects, Prog Retin Eye Res, 2000;19:1–40. Hayreh SS, Ischemic Optic Neuropathies, Berlin Heidelberg: Springer-Verlag, 2011. Raza AS, Hood DC, Evaluation of the structure-function relationship in glaucoma using a novel method for estimating the number of retinal ganglion cells in the human retina, Invest Ophthalmol Vis Sci, 2015;56:5548–56. Hood DC, Kardon RH, A framework for comparing structural and functional measures of glaucomatous damage, Prog Retin Eye Res, 2007;26:688–710. Malik R, Swanson WH, Garway-Heath DF, ‘Structure-function relationship’ in glaucoma: past thinking and current concepts, Clin Exp Ophthalmol, 2012;40:369–80. Quigley HA, Dunkelberger GR, Green WR, Retinal ganglion cell atrophy correlated with automated perimetry in human eyes with glaucoma, Am J Ophthalmol, 1989;107:453–64. Kerrigan-Baumrind LA, Quigley HA, Pease ME, et al., Number of ganglion cells in glaucoma eyes compared with threshold visual field tests in the same persons, Invest Ophthalmol Vis Sci, 2000;41:741–8. Kampougeris G, Spyropoulos D, Mitropoulou A, et al., Peripapillary retinal nerve fibre layer thickness measurement with SD-OCT in normal and glaucomatous eyes: distribution and correlation with age, Int J Ophthalmol, 2013;6:662–5. Lim CS, O’Brien C, Bolton NM, A simple clinical method to measure the optic disk size in glaucoma, J Glaucoma, 1996;5:241–5. Jonas JB, Optic disk size correlated with refractive error, Am J Ophthalmol, 2005;139:346–8. Lachkar Y, Sellem E, [La papille glaucomateuse en pratique], France: Chauvin B&L, 2004. Available at: www.bausch-chauvin. com/tele/fichiers/33/Papille%20glaucomateuse.pdf (accessed at September 22, 2017). Siamak Ansari–Shahrezaei S, Maar N, Biowski R, Stur M, Biomicroscopic Measurement of the Optic Disc with a High- Power Positive Lens, Invest Ophthalmol Vis Sci, 2001;42:153–7. Spencer AF, Vernon SA, Optic disc measurement: A comparison of indirect ophthalmoscopic methods, Br J Ophthalmol, 1995;79:910–5. Ansari-Shahrezaei S, Stur M, Magnification characteristic of a +90-diopter double-aspheric fundus examination lens, Invest Ophthalmol Vis Sci, 2002;43:1817–9. Martínez de la Casa JM, Saenz Francés F, Fández Vidal AM, et al., Agreement between slit lamp examination and optical coherence tomography in estimating cup disc ratios, Eur J Ophthalmol, 2008;18:423–8. 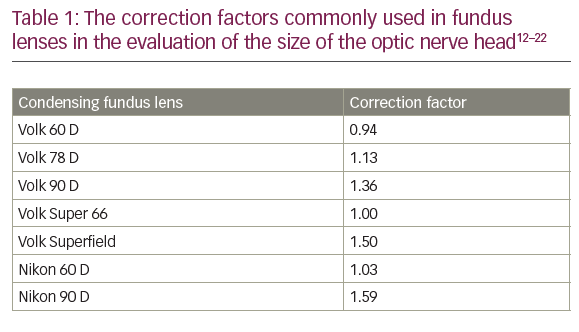 Grigera D, Clinical estimation of optic disc size, Glaucoma Now, 2011; 1. Available at: https://pdfs.semanticscholar.org/e5f3/ a7b39fa5083eb5e3508247662c4e5bb00923.pdf (accessed 29 August 2017). Jonas JB, Gusek GC, Naumann GO, Optic disc, cup and neuroretinal rim size, configuration and correlations in normal eyes, Invest Ophthalmol Vis Sci, 1988;29:1151–8. Broadway DC, Nicolela MT, Drance SM, Optic disc appearances in primary open‐angle glaucoma, Surv Ophthalmol, 1999;43:S223– 43. Hoffmann EM, Zangwill LM, Crowston JG, Weinreb RN, Optic disk size and glaucoma, Surv Ophthalmol, 2007;52:32–49. Jonas RA, Wang YX, Yang H, et al., Optic disc - fovea distance, axial length and parapapillary zones. The Beijing Eye Study 2011, PLoS ONE, 2015;10:e0138701. Bhartiya S, Gadia R, Sethi HS, Panda A, Clinical evaluation of optic nerve head in glaucoma, J Curr Glaucoma Pract, 2010;4:115–32. Gandhi M, Dubey S, Evaluation of the optic nerve head in glaucoma, J Curr Glaucoma Pract, 2013;7:106–14. 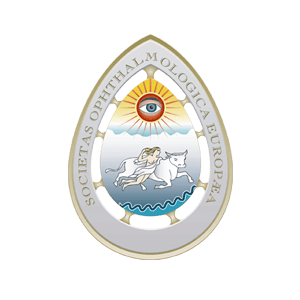 Reis ASC, Toren A, Nicolela MT, Clinical optic disc evaluation in glaucoma, European Ophthalmic Review, 2012;6:92–7. Greenfield DS, Siatkowski RM, Glaser JS, et al., The cupped disc. Who needs neuroimaging?, Ophthalmology, 1998;105:1866– 74. Tielsch JM, Katz J, Quigley HA, Intraobserver and interobserver agreement in measurement of optic disc characteristics, Ophthalmology, 1988;95:350–6. Spaeth GL, Lopes JF, Junk AK, et al., Systems for staging the amount of optic nerve damage in glaucoma: A critical review and new material, Surv Ophthalmol, 2006; 51:293–315. Mackenzie PJ, Mikelberg FS, Evaluating optic nerve damage: pearls and pitfalls, Open Ophthalmol J, 2009;3:54–8. Fingeret M, Medeiros FA, Susanna Jr R, Weinreb RN, Five rules to evaluate the optic disc and retinal nerve fiber layer for glaucoma, Optometry, 2005;76:661–8. Uhm KB, Lee DY, Lee JS, Hong C, Sensitivity and specificity of qualitative signs to detect glaucomatous optic nerve damage, J Korean Ophthalmol Soc, 1998;39:153–62. Lee JLS, Nicolela MT, Chauhan BC, Rates of neuroretinal rim and peripapillary atrophy area change, Ophthalmology, 2009;116:840– 7. Vingrys AJ, The many faces of glaucomatous optic neuropathy, Clin Exp Optom, 2000;83:145–60. Siegner SW, Netland PA, Optic disc hemorrhages and progression of glaucoma, Ophthalmology, 1996;103:1014–24. Bengtsson B, Leske MC, Yang Z, Heijl A, EMGT Group, Disc hemorrhages and treatment in the early manifest glaucoma trial, Ophthalmology, 2008;115:2044–8. Budenz DL, Anderson DR, Feuer WJ, et al., Ocular Hypertension Treatment Study Group, Detection and prognostic significance of optic disc hemorrhages during the Ocular Hypertension Treatment Study, Ophthalmology, 2006;113:2137–43. Drance S, Anderson DR, Schulzer M, Collaborative Normal-Tension Glaucoma Study Group, Risk factors for progression of visual field abnormalities in normal-tension glaucoma, Am J Ophthalmol, 2001;131:699-708. Healey PR, Mitchell P, Visibility of lamina cribrosa pores and openangle glaucoma, Am J Ophthalmol, 2004;138:871–2. Abe RY, Gracitelli CPB, Diniz-Filho A, et al., Lamina Cribrosa in Glaucoma: Diagnosis and Monitoring, Curr Ophthalmol Rep, 2015;3:74–84. Tezel G, Kolker AE, Kass MA, et al., Parapapillary chorioretinal atrophy in patients with ocular hypertension. I. An evaluation as a predictive factor for the development of glaucomatous damage, Arch Ophthalmol, 1997;115:1503–8. Tezel G, Kolker AE, Wax MB, et al., Parapapillary chorioretinal atrophy in patients with ocular hypertension. II. An evaluation of progressive changes, Arch Ophthalmol, 1997;115:1509–14. Hitchings RA, Spaeth GL, The optic disc in glaucoma. I: Classification. Br J Ophthalmol, 1976;60:778–85. 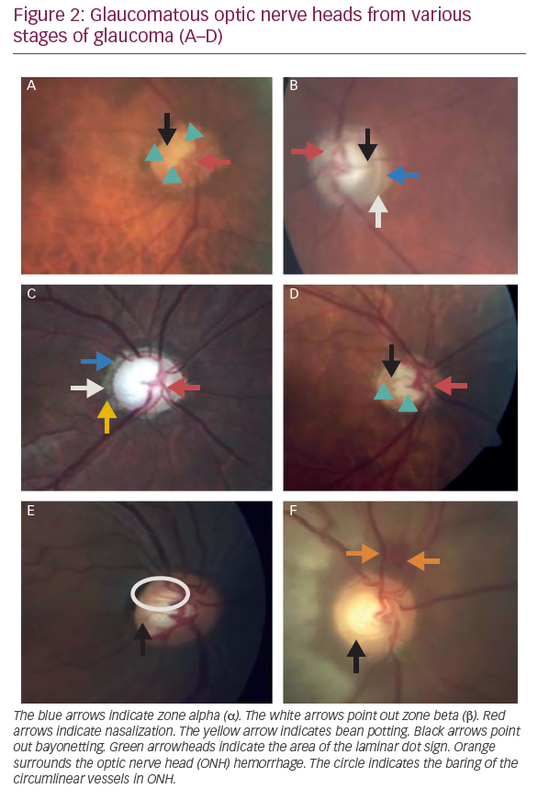 Savatorsky E, Mwanza J-C, Budenz DL, et al., Longitudinal changes in peripapillary atrophy in the ocular hypertension treatment study, Ophthalmology, 2015;122:79–86.